Pioneer Electronics (USA) Inc. Professional Sound and Visual Division today unveiled its most affordable controller to date, the DDJ-WeGO, an ultra-compact system that enables consumers and music enthusiasts alike to mix their own music creatively. For easy setup, the DDJ-WeGO is bundled with the Virtual DJ™ Limited Edition DJ software and has the ability to perform music stored on a Windows PC or Mac. 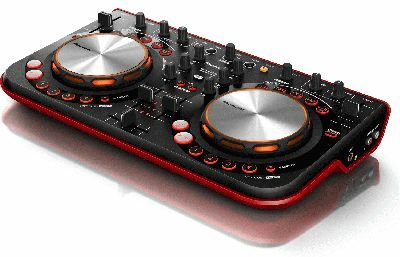 The DDJ-WeGO is available in five body colors, white, black, red, green and violet, to match a user’s individual taste. The unit also features multi-color LED backlighting for the Jog wheel, and the user interface of the included software can be color customized. Mix Pulse – The mix pulse mode shows the difference in pitch of songs currently playing through the light of the Jog wheel. As the pitch of songs begin to match, the intensity of the light increases, allowing the user to visually check that the beats are in sync. In conjunction with the music, the pulse of lights helps to improve beat matching skills. Compact size and weighs less than four pounds for easy transportation. The DDJ-WeGO will be available in September 2012 with a suggested retail price of $399.